The above map shows the theoretical potential of different areas in Bulgaria for energy production. 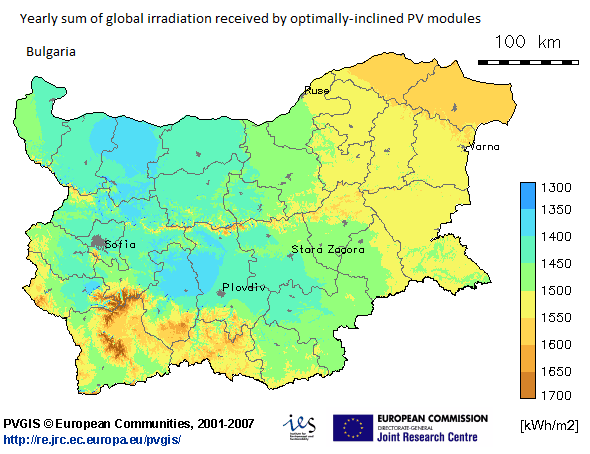 According to it one of the the most appropriate areas for development of photovoltaic projects is southern Bulgaria where the intensity of solar radiation on annual basis is more than 1500 kwh/m². In North-Esatern Bulgaria the radiation is even higher. North-Eastern Bulgaria is world famous for being appropriate for wind energy projects(Kavarna). In these areas of Bulgaria a photovoltaic system is theoretically expected to generate not less than 1300 kWh/year from each kWp installed. The best months for operation are May-August when the radiation is far more than the average for the year. In December a photovoltaic system generates three times less than in August. In connection with the weather conditions and the annual change of the Sun's azimuth it is proved that the optimum angle for fixed photovoltaic systems lies between 30º and 34º. The optimum angle for December is 63º while for June is 6º the Linke Turbidity in the most southern parts of the country reach up to 4.8 but the mean value is around 3 on annual basis. It could be said that in Bulgaria the mean annual ratio of diffuse to global irradiation is 0.5. In the areas appropriate for photovoltaic projects in the south eastern parts of the country the mean air temperature is around 13 Cº. In order to define whether a site is suitable for installation of a photovoltaic system a specific estimation of its potential is necessary and required. Madison Bulgaria possesses the necessary equipment and knowledge base to do that for its clients.